The Earth Actually is a "Tilting" Planet ...&... Recently, It May Have "Tilted Again".... BUT: ... Is the Earth a "Swiftly Tilting Planet"? According to author, Jaysen Rand, there have been two significant axis shifts of the earth in the last 20 years. The shifts in question were a 2,000 mile shift. We don't notice this because the earth rotates at about 1038 MPH anyway and rotates 25,000 miles every day. So if we don't feel those speeds & distances; we also would not feel a "measly" 2000 mile shift. However...Mother Nature does feel it...and gives a little "shrug" which we humans experience as a 10 - 20 degree F. difference in our climate. Jaysen Rand believes that this Earth Shift is the reason we have such bizarre climate changes at this time. Blame It On a Solar Flare ... but where was the Flare? At the same time of the discrepancy; all GPS was knocked out. Later the loss of all global GPS satellite systems was said to be due to a Solar Flare...only problem is...there is no record of Solar Flares at that same time...and almost all the SOHO Solar Data for those times is....missing. According to Jaysen Rand, this is not a "glitch". The event occurred during a Solar Minimum... and the Space Weather forecasts called for low-level activity that day. THE DISAPPEARING SOLAR FLARE ??? Why did NASA & NOAA declare that a historic solar flare trashed the entire GPS satellite system, yet they have no images of the flare before the outage? All of the images of the sun have been deleted from the NASA, ESA & SOHO files. 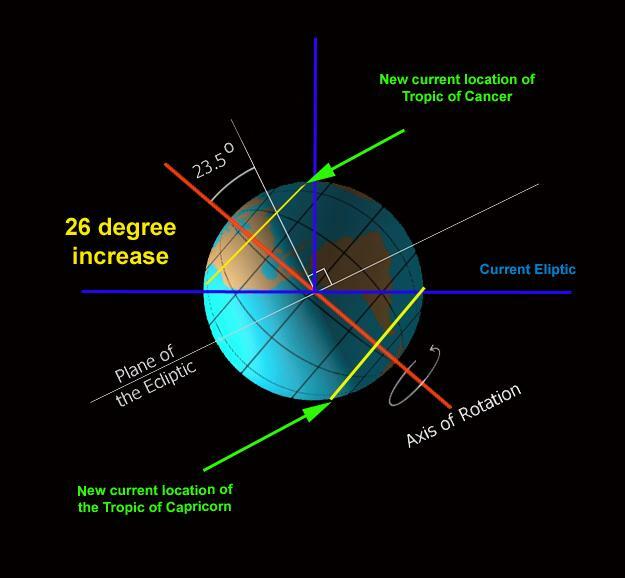 From the evidence so far, it appears the change to the earth's axis occurred in several smaller axis shifts, rather than all at once. The most significant shifts appear to be on Dec 4th and Dec 6th of 2006 ... and this was also the period of time during which the GPS system failed across the globe. An exceptionally active solar region (930) rotated onto the solar disk at a time when solar cycle 23 was theoretically approaching minimum levels. On December 5th 2006 at 10:18 UT region 930 generated an X9 flare that can be seen in both the sequence of GOES-13 SXI images and in the plot of GOES Space Environment Monitor data. Region 930 continued to generate flares over the ensuing two weeks and resultant ion storms were also recorded by GOES. One such storm had sufficient energy to be recorded at ground level by neutron monitoring stations. GOES 13 SXI sustained damage to several pixels of its detector while observing this X9 flare event. The source of the damage was the large X-ray flux of the flare convolved with the observing sequence. At the time, the susceptibility of the detector to radiation damage was not well understood or constrained. The type of damage affects 8 lines of pixels across the CCD and is unlikely to recover. Operational constraints and updates to on-board observing sequence software will enable the SXI to continue its mission without further damage to its detector. The impact on observations and prediction is currently being assessed as the new sequence software and operational constraints are developed. In addition, ground alogrithms will be developed to minimize the appearance of the 'lost' lines through interpolation or other means. The chart below is the actual data of solar emissions, including the date which NOAA claimed a historical solar Flare occurred on Dec 5, 2006 from 10:18 UT to 10:45 UT. If you go and look at the actual readings of solar emissions and activities and images of the sun for that specific time and date... almost all of the data & images are missing. Of the few data sources they overlooked and forgot to delete... none of the data supports NOAA's claim. On the chart below you can clearly see that there is no increase in emissions on Dec 5th, 2006 between 10:18 UT and 10:45 UT. This chart shows the solar emission data chart between Nov 14, 2006 and Dec 12, 2006. You can clearly see that the readings for Dec 4-6 are in line with readings in November and later in December. In fact, many other dates shown on this chart are much higher than the Dec 5 & 6, 2006 dates they falsely claimed had a historic solar flare which knocked down the GPS system. Any readings with -1 means that the data was not received or read for those dates and times. It is an auto-generated numeral for missing data. On the dates of the so-called historic flare, the images are all curiously missing. There are no images for Dec 4th or 5th and for Dec 6th, the images are only available after 2000 hours Zulu. For such a historic event as they claim the Dec 5, 2006 10:15 -10:45 UTC flare to have been, it seems very odd that all of the images are missing for those specific dates. Multiple images are taken each day by SOHO. Usually once or more times each hour but these are all the images available for these dates. Images on the important dates and times are missing. The images for 12/4 and 12/5 2006 are missing in entirety. The images on 12/6 are only available after 20:36 Zulu. 2 hours after the event ended. For a supposed historic flare which they claim damaged the GPS system, it is unbelievable that those very images would be missing. These are the SOHO MDI Magnetogram images of the sun for 2006. There are no images for Dec 1-3; no images for Dec 5-11; no images for Dec 16, 19, 20, 25, 29 or 30. Again, this is more than a conspicuous absence of solar images during the supposed historical solar flare on Dec 5 & 6. In each instance those dates are missing. These are the SOHO MDI Continuum images of the sun. There are no images for Nov 15, 16, 17, 19, 20, 21, 23; no images for Nov 25 thru Dec 10; no images for Dec 12, 14, 16, 17, 18, 20; no images for Dec 22 thru Dec 26; no images for Dec 28, 30; no images for Jan 1, 3, 4, 6, 9, 14, 15. Again, this is more than a conspicuous absence of solar images during the supposed historical solar flare on Dec 5 & 6. In each instance those dates are missing. - The SOHO EIT 195 images of the sun for 2006. These are heavily filtered images of the surface of the sun. As with all the others. there are no images for Dec 1-12, 2006. But they had plenty of images for other dates. For Dec 13 and 14, shown below, there are 16 images for each date. Again, this is more than a conspicuous absence of solar images during the supposed historical solar flare on Dec 5 & 6. In each instance the images for those dates are missing. These are the SOHO EIT 304 images of the sun for 2006. These are heavily filtered images of the surface of the sun. As with all the others. there are no images for Dec 1-13, 2006. Again, this is more than a conspicuous absence of solar images during the supposed historical solar flare on Dec 5 & 6. In each instance the images for those dates are missing. - OTHER INSTANCES OF "COVERING UP"? [A] - (yellow image below) The Blocking a small patch on the surface of the sun for Dec 15 at 07:06 zulu. The only reason to insert a patch is to hide something they do not want the public to see. This has been done on a variety of images. [B] - (blue image below) Shows purposely blocked off most of the image and even went to the trouble to add a second small "patch". "Someone" does this anytime they don't want the public to see something, but; you can see the streak coming in from the lower left. A streak caused by a moving object which "they" did not want you to see. BIG NOTE: According to Jaysen Rand ... the lack of any images for this period clearly would appear to substantiate that the Dec. 5th, 2006 "historic" flare was nothing more than a cover story... for what really affected Satellite Views and GPS functioning. Which Way Did The Earth Tilt? This means that if you live in the U.S....and on June 21st....the Sun rises & sets to the North of you....there has been a shift. Normally, The Tropic of Capricorn runs through Brazil...with the Sun at its Zenith on Dec. 21st. Now...according to Jaysen Rand...the Tropic of Capricorn runs through the tip of South America. 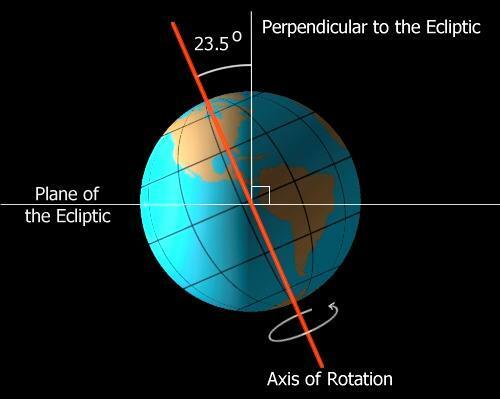 The Sun will still be directly over the Equator at those times. As a Result; the Planet Earth = the Sun & is Semi-Octile the Moon. This is the World Chart at the time of the Axis Shift. Does the chart reflect such a shift? "The Subtle Atmosphere or Climate" - and "a Major Change in Daily Acitivity" - are "Connected" - to the Sun or the "body of the Earth". 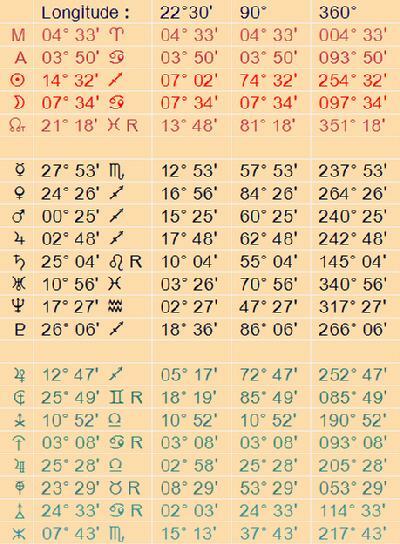 the Blue Star is a placeholder for the Sun / Moon Midpoint. "the Earth's body, its heaviness & weight is disrupted in its "daily activity". The "Resource" of this Chart (the Earth) experiences "a Turnover or a Rotation"
"A Turnover" (or Rotation) of Orientation is "Mightily or Forcefully Successful"
"There is a "Great Tension" that "Runs - Out"
"The Air and /or the Great Tension it is Under, Expands or Runs-Out ." This is a very important finding, as A NASA article for October 1998 stated that "A Solar Wind blew away some of Earth's Atmosphere". Did this happen again, when the Earth "tilted'?